The main entrance is on Splaiul Independentei 2D Street, where you have direct and easy access also with a car to our hotel parking area, while the second entrance is on Franceza No 38-42 Street. The taxi station is just outside the arrival terminal. The way to the hotel will take around 30-40 minutes and it will cost around 60 RON. you may say to the taxi driver “Splaiul Independentei 2D Street, Old City. It is highly recommended to order a taxi from an authorized taxi company by selecting it from the taxi machines (in yellow) in the arrivals terminal. For more exclusive service, we will be more than happy to arrange a private transfer to the hotel. The driver will wait for You inside the arrivals terminal near the flowers stand, with a signboard and will help You with the luggage. The transfer is held by a professional English-speaking driver with a fully equipped Mercedes E-Class car and costs EUR 30.00 (1-3 people) or EUR 60.00 (4-8 people). If you decide to arrange the private transfer, we need all your flight information (flight no., country, airline name, time of arrival, number of persons). Hop on one of the busses that depart every 40 minutes from the arrivals terminal to the centre of Bucharest, at Piata Unirii 1. 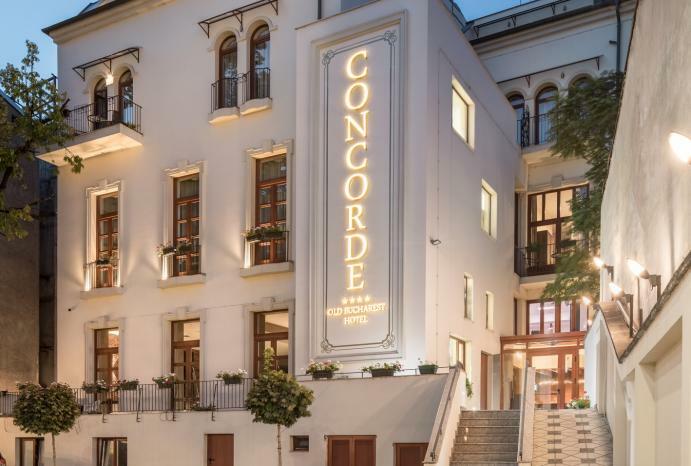 From there, Concorde Old Bucharest Hotel is just a quick 5 minutes’ walking distance. Please set on your GPS “Splaiul Independentei 2D” or “Concorde old Bucharest hotel”. The hotel has its own limited parking area and we kindly inform you that the daily fee is EUR 28.00, upon availability. Should you wish us to save you a parking space, Please send us your firm request and we confirm availability. Please note that one day of parking is 24 hours, beginning at 12:00 from the day of arrival and ending at 12:00 the next day. From the central train station “Gara de Nord”, you can take Bus number 123, once you arrived to Piata Unirii 1, Concorde Old Bucharest Hotel is just a quick 5 minutes’ walking distance. From “Gara de Nord”, go to the subway station “Republica” and get off at “Piata Unirii” station. From there, it takes only 5 minutes walking distance. Have a safe Journy ! We are waiting for you.